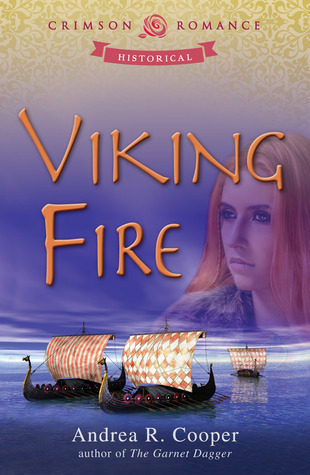 The blurb for Viking Fire caught my eye when the request was sent and I just had to check it out. I am always a sucker for a really good historical romance - and having a soft spot for vikings helped, too. Kaireen is in some ways your typical historical heroine - headstrong, independent, and determined not to marry just because her parents say so. In other ways she was very unique - she wasn't perfect. In the beginning she showed signs of being a bit snobbish and spoiled - but learned her lesson in those areas as she grew as a character. Bram was a bit of a mystery. He was foreign to her lands, but had earned the trust of Kaireen's parents and her clan, but hadn't earned Kaireen's. He finds ways to repeatedly prove himself to her as loyal, but she still wonders if their marriage is one of convenience and politics or if there could be love. There is a lot of action in this for a romance, but not so much that the romance falls from center stage. Every action had a purpose of bringing Kaireen and Bram closer together. This romance also includes a good bit of mystery and intrigue in its midst, giving yet another depth to the story. This threads hangs out in the background, reappearing in bits and pieces as the story unfolds, but really comes to a head when a rival clan leader is killed. It took me awhile to figure out all the players involved in the plot, and I really enjoy figuring out the bad guy at the same time as the character instead of knowing all along. And our bad guys here are really bad - and their story is quite unique as well and led to several big reveals as the story wrapped up. The minor downside was something that may be attributed to being a newer author. Two or three times it seemed like entire phrases or paragraphs were repeated - not word for word, but in a way that made me think I'd accidentally turned back a few pages. It didn't detract much from the overall enjoyment, but it was just enough to keep this from getting the full five stars it would have otherwise received. Thank you. I'm thrilled you enjoyed the story.